The brochure collection has grown to over 1,000 different brochures over the years. At first only brochures published in the Netherlands and Belgium, but since the rise of the internet the collection has expanded with brochures published in England, America, Canada , Australia, Germany and France. Below an overview of the model ranges in which the brochures are arranged. When you follow the links and then click on the pictures, a pop-up window appears containing a larger picture of the brochure. Curious which brochures are recently added to the collection?, just click here. 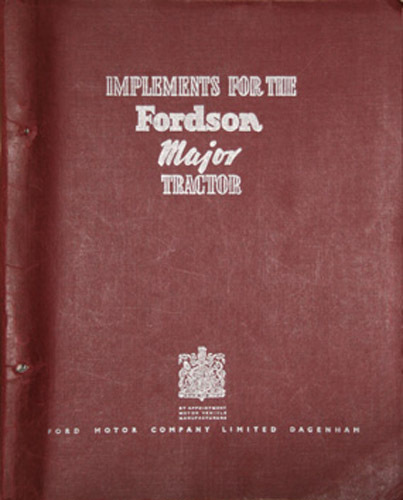 - Fordson Major E27N implements , published in a seperate sales binder with at the back of the brochures the following logo. In the fifties the dutch Ford importer started publishing Ford Tractor news booklets. You will find a complete overview.